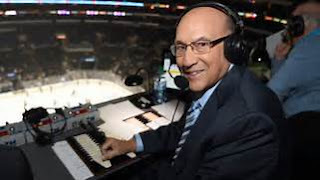 Bob Miller, the legendary Hall of Fame play-by-play announcer for the Los Angeles Kings for 44 years, will receive the Jim Murray Memorial Foundation's Lifetime Achievement Award at the annual Day at the Races & Monte Carlo Night event on Sept. 30 at Santa Anita Park. Miller, who announced his retirement from his play-by-play duties with the Kings on March 2, due to health issues, said "Goodnight and Goodbye" on the Fox Sports West telecast of the Kings-Ducks game from Anaheim on April 9. While at the University of Iowa, Miller earned a degree in Communications/Radio-TV and began his broadcasting career covering the Iowa Hawkeye's football and basketball games for campus station WSUI, now KRUI-FM. After his graduation in 1960, Miller began working in television sports journalism in Wisconsin and would later become an announcer for the football and hockey teams at the University of Wisconsin-Madison. Miller was honored by the Hockey Hall of Fame as the 2000 recipient of the Foster Hewitt Memorial Award, and is in the Los Angeles Kings Hall of Fame, as well as the Wisconsin Hockey Hall of Fame, and the Southern California Sports Broadcasters Hall of Fame. The press box at Staples Center, the Kings' home arena, is named in his honor. The Big Ten Club honored Miller as their 2014 Person of the Year and the Southern California Radio & TV News Association presented Miller with its Lifetime Achievement Award at the 65th annual Golden Mike Awards banquet in January 2015. He received the 2,319th star on the Hollywood Walk of Fame on Oct. 2, 2006. Miller's first book, Tales From the Los Angeles Kings, was published in October 2006. His second book, Tales From The Los Angeles Kings Locker Room: A Collection Of The Greatest Kings Stories Ever Told, was published in April 2013. Bob and his wife, Judy, live in West Hills, Calif., and have two adult children. "Personally, it gives me great pleasure to honor my longtime friend Bob Miller with the JMMF's 2017 Lifetime Achievement Award," said JMMF CEO and founder Linda Murray Hofmans. "Bob's passion for his craft as a play-by-play announcer for the Los Angeles Kings, his love for the Kings, the fans, the city of Los Angeles, plus his loyalty and support of the JMMF are beyond measure." The Jim Murray Memorial Foundation (JMMF) was established by Murray Hofmans in 1999 following the death of her husband, Jim Murray, longtime Los Angeles Times sports writer, winner of the 1990 Pulitzer Prize for Commentary, and 1988 Cooperstown Hall of Fame inductee. The JMMF awards journalism scholarships to the nation's top college journalists through a national essay competition. To date, the JMMF has awarded 104 scholarships totalling more than $525,000. Thirty-six colleges and universities across the United States participate in the annual competition. Five 2017 Murray Scholars will be honored at the Sept. 30th JMMF Day-at-the races & Monte Carlo Night event at Santa Anita Park in Arcadia, Calif. I like hockey. It's the fastest game that men play. It's exciting to watch. The action swirls as in no other sport. bumps into you coming off an escalator, even though he's going only — maybe — 4 m.p.h. or less, you get angry, right? You want to say, "Hey, man! Why don't you watch where you're going?!" You have to resist the urge to push him. Punch him. Now, consider if the guy is moving at 20-25 m.p.h. And you're moving at the same rate of speed. And, consider that he does it on purpose. Now, that's a collision that will make you mad. Even homicidal. And you already have a club in your hands. It's no wonder hockey gets ballistic. Hockey heroes are often the nicest guys in sport. Gordie Howe was probably the greatest to play the game. But he was as patient explaining the game to reporters as any superstar I have known — with the possible exception of Magic Johnson. But, having said that, I must say the NHL, players (and owners) remind me of a kid playing with a stick of dynamite in the present strike. I can't believe these guys can't find a better way to deal with their labor problems than by putting the sport on the brink of extinction. These guys really are icing the puck. Some years ago, in a burst of candor, I wrote that, while I liked hockey, I had to confess I never saw a goal scored. I mean, if that red light didn't go on, I wouldn't know whether one had been scored or not. You see, that's the flaw in the ice game. That puck is only about 2-3/4 inches wide and less than an inch thick. You take it on blind faith that it's there. It's disastrous for television. In addition to its already low profile, that puck is flying at 100 m.p.h. when it is visible. A tennis ball looks like a balloon by comparison. A football is highly visible at all times even when thrown by Dan Marino. It's perfect for the television screen. A basketball is the size of a full moon. You can see it go into a basket, all right. Even a slam dunk can be seen from the rafters. A baseball is somewhat smaller, but it is seldom surrounded by 10 or more players in bulky costumes and pads. What this, of course, means, is that hockey is the least felicitous of sports on television. While other sports manage to carve out billion-dollar contracts from the great god network television, hockey must live within its means. In other words, it must subsist on seat sales, gate revenue. Hockey is sport's stepchild. It must sit by the fire and envy. The gaudy salaries paid out in other sports — Bobby Bonilla's $6 million, Ryne Sandberg's $7 million — are a function of television revenues. Television is the reason a pro football franchise in, say, Green Bay can compete with a franchise in a metropolis such as New York. The game could not begin to pay Joe Montana a multi-million-dollar salary if it had to depend solely on gate revenues from eight home games per season. Hockey sees these swollen salaries, the comparatively wide open free agency, the high life enjoyed by other sports and, probably thinks, why not me? But hockey's best TV offer was $17 million per year. For the whole league. The last time we looked, pro football was getting $17 million per franchise from TV. Baseball does not share revenue — save for the billion-dollar, multiyear network contract. Regional broadcasting and telecasting rights are kept by individual teams. And the Yankees pulled down $42 million for their local share alone last year. That's twice what a whole league is paid in hockey by TV. Without a television fallback of those dimensions, hockey must exist on poverty row. What is needed is parity with other sports in the counting house. This is attainable only if TV comes in with its big-bucks subsidy. It's hard to imagine how striking the most lucrative and attention-getting part of the season can be a step toward getting that equalization. It looks suicidal. Hockey is holding a gun to its head. I don't think I'm going to see a goal scored here, either.